As with previous years' Frostscythes this one does not have any Intellect, making it comparable to much lower itemlvl alternatives. The 899 int provides 0.35% spell crit and 899 spell power, which the wowhead comparison UI unfortunately does not show. The upgraded 471 blue staff easily beats the Frostscythe. Seems like here required something else . Hm , maybe they should add some sort of DOT proc at this weapon ? Drops from the satchel you get for killing Lord Ahune, the daily boss for the Midsummer Fire Festival. Probably one of the coolest looking weapons in the entire game. Edit: meant you get the drop possiblity from killing her. Sorry for my poor English, Polish is my first language. This weapon,like previous years, will most likely turn out to be used by druids, do to the insane stamina. Is there 100% chance that you will get the staff ? On Chinese server the festival has begun, but reports say that drop is the 353 one. May need a hotfix when confirmed on other regions. So, this drops from the daily satchel? On a side note, any drop chances for this year? God, I hope I finally get this thing. I've got a blue-skinned troll Frost Mage that I've been aching to give this to, but so far no luck. So, am I the only one who is crazy excited to see warriors dual wield these? With the change to let them Titans grip polearms, and being able to transmog a polearm into a staff, Im really gonna regret not having my warrior high enough to win one of these by the time the festival is over. can anyone confirm if you can loot this as a non-caster? 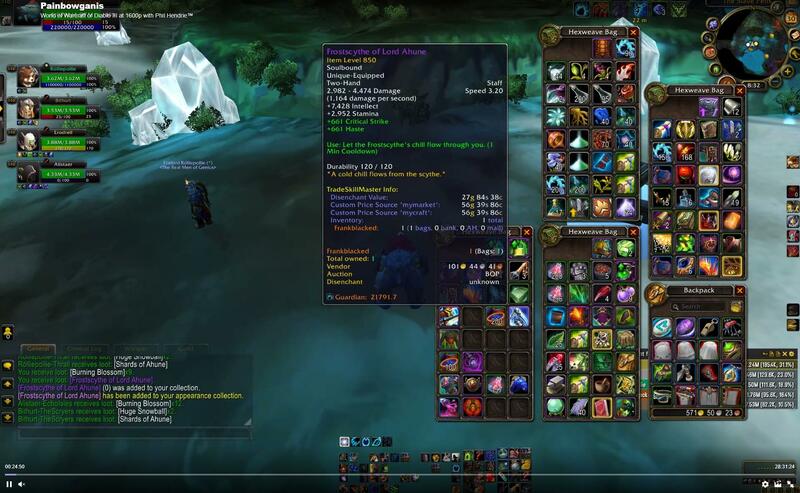 I saw a DK looting the 353ilvl version from a satchel yesterday. My guess is that this was a bug, but now I wonder if this has been fixed? EDIT: Today I saw a Hunter getting the 480ilvl version. So yes, all classes can loot this from the satchel and it is indeed now a 480ilvl item. Goes very well with the Warlock S14 gear. A fantastic Warlock mog item all round, really. I think it was hotfixed. The ilvl 480 version dropped for me today (06/23/2013) from a 한기서린 물품 주머니. Hey warriors, want a cool looking scythe? Then don't trash this if you get it. Remember that polearms and staffs xmog together. If you get Bo-Ris or perhaps a future strength polearm, you've got yourself a scythe. Blizzard, why you no add Int to this staff. Anyway, I wanted to see if I could at least use the Frostscythe's Chill effect, which of course I couldn't. Strangely enough, because I couldn't equip it or anything, it gave me an error when I clicked on it. "You must reach level 88 to use that item." Now I'm not sure if this is just a bug or if it's talking about the chill effect having a strange requirement, but it's definitely odd. Just looted this on my paladin (as opposed to my priest, mage, druid, or warlock I have also been farming this quest on for the pet). And can't even equip it or pass it on to my more deserving alts. Sigh. Ive always used the older version on my frost mage for transmog but always thought the lack of Int made it a poor choice for equipping. I got the 480 staff on the first and second days of the festival and out of curiosity I thought i'd see what difference it made to his dps. On repeat runs at Ahune to help my guild mate grind the cloak he wanted, my dps soared from 23/24k to 38/40k which confused me. I then tried swapping between it and the 450 BoA staff (Dissector's Staff of Mutation) i had against the dummies in the city with the same result. Can't explain it - maybe someone else can ? (feel free EJ types) I would appreciate it. They really need to stick in a polearm version of this weapon for plate users (since warriors are the only ones who can use staves out of the three plate classes). It goes to waste on paladin and death knight toons who get their hands on it by random chance. That, or give paladins and death knights the ability to use staves so we can mog them onto polearms. I would always rock that weapon as a mog for my death knight. Not sure about the rate but did get it twice within days from each other on my warrior. Just got this yesterday after my 2nd run to Lord Ahune. And naturally - I'm a hunter and can't use it. Awesome. If Death Knights could wear staffs this would be a great DK tank weapon. Sh*tload of stamina, crit strike (paired with good mastery from other gear) and haste are all fine. If you ignore the spellpower though. A crying shame that this can't be used for a DK to transmog. Blizzard really needs to throw some more strength polearms in the form of wicked looking scythes. We have death in our names! Nothing will make you feel more happy then loot it as paladin on first run of the year..
As of 5.4, apparently TG wars can dual wield this. I've wanted to see that since this scythe was first introduced into the game. got it yesterday on my warlock i was so scared to not see it drop this year, but luckily and im really never lucky with RNG i got it from first satchel i went crazy on guild chat it was the last part for my transmogrify set. They REALLY need to make this BoA so we only need one for multiple characters. Says removed but I got it on two of my characters this year. Screenshot from my twitch stream taken on 2017-06-30.